Agile tools allow teams to collaborate and share updates through various stages to create a flexible work process that adapts to changing events, even in a non-IT sector. Using Agile tools in a non-IT sector is common practice now. Agile methodology increases performance and delivers valuable products by adapting to changing events in the workplace. Agile tools ensure a quick response to changes in every stage of production, including team communication, task management, issue tracking, and knowledge sharing. Many industries benefit from this management method, including sectors such as marketing, education, car manufacturing, publishing, transportation, and recruiting. Still, it can be difficult to decide what management tools you want to implement for your company. This article touches on why a non-IT company needs a management solution, and how Agile technologies can solve many of your project problems. Most companies use the Agile approach as a response to evolving projects. Many businesses struggle with creating a flexible project system that encourages collaboration in a large community. Agile helps foster adaptability within large companies. For example, many small companies depend on email as their main form of communication. Still, as the company grows with more projects and deals, the effectiveness of email decreases. Businesses need a tool that makes it easy for employees to prioritize tasks and guide teams throughout project stages. Agile tools, such as Jira Software or Trello, can help a business overcome these problems. The tools allow businesses to divide projects into smaller tasks and organize these tasks into groups by sprints. Each small task has only one person responsible for its completion. The manager can monitor these tasks depending on overall project progress or by sprints. This method provides businesses with the flexibility to change the initial plan at any time. Communication is a crucial part of a business community. The agile approach promotes employee interaction and collaboration, especially while working on the same project. Confluence, the wiki-documentation store that allows businesses to make some information private and secure while also permitting some data to be public. Agile management tools can help businesses respond to unpredictable situations and deliver a real product. Your company can split a project into tasks and assign a person to each one. It can also create sub-tasks to involve more employees. 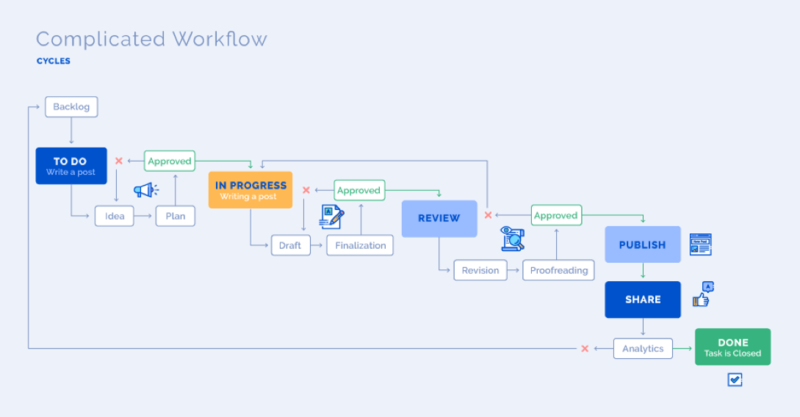 Jira supports different workflows, especially nonlinear work processes. Your company can start a task, review it, redo the task and repeat these activities as many times as required to effectively complete a project. Below is a scheme that represents the content creation workflow at Rozdoum, a software development house that provides outsourcing services. When Rozdoum started its content marketing strategy, the processes were rigid and straightforward. The tools were not adaptable. 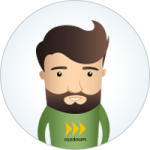 With the growth of the marketing team, Rozdoum added operations to improve content creation. The initial workflow developed into a more complicated but flexible plan. Although more complex, this new plan allowed Rozdoum to create a more effective and flexible workflow. Emails and spreadsheets stop being sufficient. When people start missing critical messages, your usual approach may be inadequate. An agile management tool can be a solution to your communication problems. Repetitive workflows and activities occupy too much valuable time during daily routines. Be smart, use a tool to automate standard actions. Create templates and patterns for tasks and documents. These tools will save time in the future. You are dealing with high risks projects in an uncertain environment. For example, huge enterprise projects have many factors and involve a lot of people. It can be difficult to figure out how to execute them successfully. As well, project requirements can change, which means your team has to adapt. Agile tools assist with task prioritization and help highlight critical points. Your business wants to deliver concrete value. Jira Software, like every agile tool, facilitates personal responsibility and encourages creativity. A business can assign an employee to do a selected task, control deadlines, and monitor efforts. It can also re-plan the project, changing assignees, priorities, statuses, and details. Your company will finish a project on time with such an organized approach. Businesses that face these common problems could benefit from Agile. As Agile tools become more common, businesses have the opportunity to streamline communication across industries. Your business knows how it wants to execute a project, but it needs the tools to implement an effective management process. If your business is unsure how to properly use Agile tools, then consult with an experienced software development firm for help. The Agile approach allows businesses to respond quickly to any unexpected demands. The implementation of the Agile approach and the incorporation of Atlassian tools should improve the success of a product in any sector. Alex T is a mobile team leader and a certified Scrum Master at Rozdoum LLC, a software development contractor and a services provider founded in 2004. Rozdoum is a certified Atlassian Solution Partner and Vendor delivering apps simplifying project management. Learn the benefits of split agency partnerships through case studies with 2 pro firms. Read detailed client reviews of web development agencies to find the best provider for your businesses. Learn about new content, initiatives, and opportunities in our newsletter, delivered to your inbox every week.